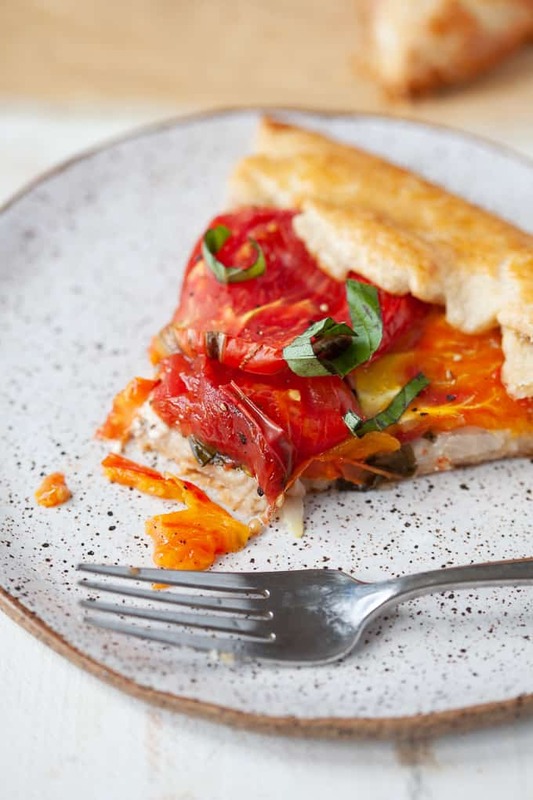 Easy, delicious and perfectly savory, this heirloom tomato basil galette with goat cheese is basically a fancier version of pizza. Pie for dinner? Need I say more? It’s been a little while since I created a new recipe for the blog. Most of you know that I’ve been recovering from post concussive syndrome and have had to take a little step back from my blog to rest and heal. It’s been really, really hard. I’ve missed my food styling and photography sessions. I’ve missed sharing recipes with you. Luckily I haven’t missed being in the kitchen though. With all of this free time on my hands, I’ve been cooking new recipes and baking lots of bread but I just haven’t had the energy to expose myself to the computer screen (which is a trigger for me) to get a new recipe up. It means the world to me that ya’ll continue to be so supportive of my recovery. I know I wrote in my last post that I was starting to feel better and slowly getting back to myself but I had a pretty bad setback a couple weeks ago that made me feel like I was back to square one again. It’s been really difficult to cope with. But hey, it could always be worse. At least I’m still here. And again, your well wishes, thoughts and prayers mean so, so much. Thank you. Now onto more important topics like pie and pizza. 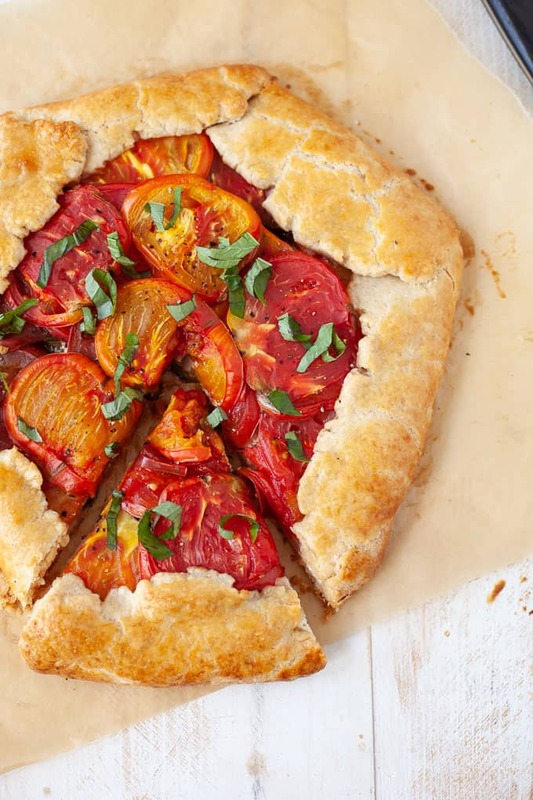 Steve came home last night and looked at the tomato galette I made and said “oh, it’s like pizza.” I laughed and was like yeah, I guess it is. Tomatoes, cheese and dough. It’s like pizza, elevated. I also like to think of galettes as an easier pie without the double crust. And I just love how they look with the simple folded over crust. Rustic and no-fuss. 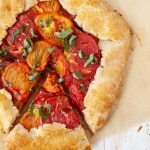 I was inspired to make a tomato galette when I saw the bounty of fresh tomatoes at my farmer’s market. One plus side to the concussion is that I’ve had the space and time to make it to my local farmer’s market weekly. 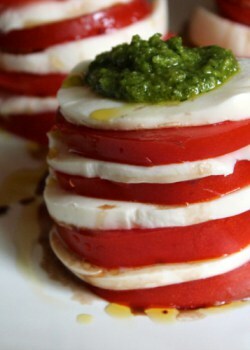 I grabbed a few heirloom tomatoes, a bunch of fresh basil and a log of goat cheese, all destined for the galette. 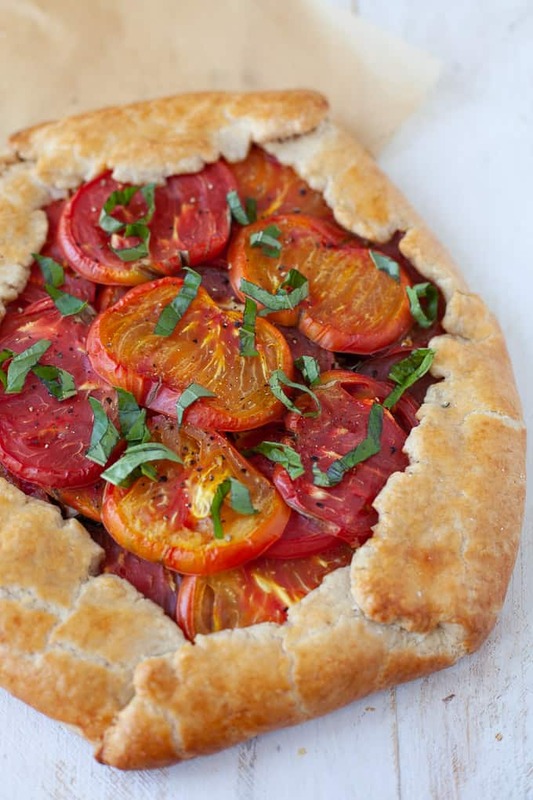 Of course, you don’t have to use heirloom tomatoes, any fresh tomatoes will work just fine. 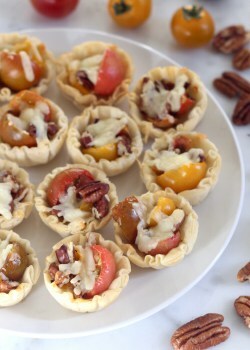 But this recipe will be tastiest while tomatoes are in-season, right now through September! 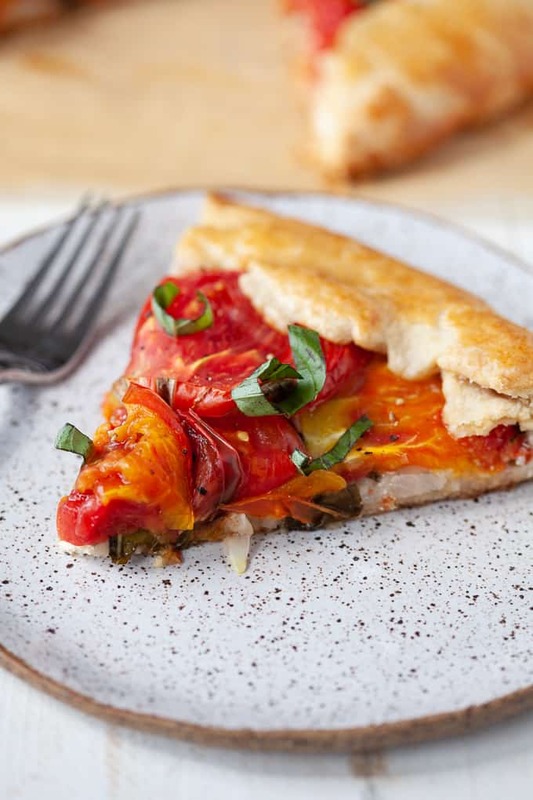 I love all the flavors in this recipe – the juicy, umami-filled tomatoes, the soft goat cheese, the fresh basil and the flaky buttery galette crust. All of the sudden I’m excited for leftovers :). It’s pretty easy to make the dough for the galette if you have a food processor. Although you do have to let it refrigerate for 30-60 minutes so if you’re in a time crunch, you could always buy pre-made pie crust at the grocery store. And you don’t have to use goat cheese; feta or mozzarella would work beautifully too. Whatever you have on hand! And if tomatoes aren’t your jam, try it with zucchini and/or summer squash! We had the tomato galette with some rotisserie chicken last night and it was a simple but delicious and satisfying meal. Roll out dough onto a lightly floured surface, about 12 inches in diameter, 1/8 inch thick. Transfer dough to parchment paper. Sprinkle the cheese, shallots and basil evenly over the dough, leaving a 2-inch border. Season with salt and pepper, to taste. Arrange the tomatoes over the cheese. Gently fold the edges of the dough over the tomatoes, covering about 2 inches of the filling, pressing gently to adhere the folds. Brush egg wash over the exposed dough edges. Bake at 400 degrees until crust is golden-brown and tomatoes are soft, about 40-45 minutes. Cool on baking sheet for 5 minutes before transferring the galette with parchment paper to a cooling rack. Gently pull parchment paper out from underneath while keeping the galette on the cooling rack. Let cool briefly, another 5-10 minutes. Serve warm or at room temperature. For a huge time saver, use store-bought pie crust. Tell me, have you ever made a savory galette before? 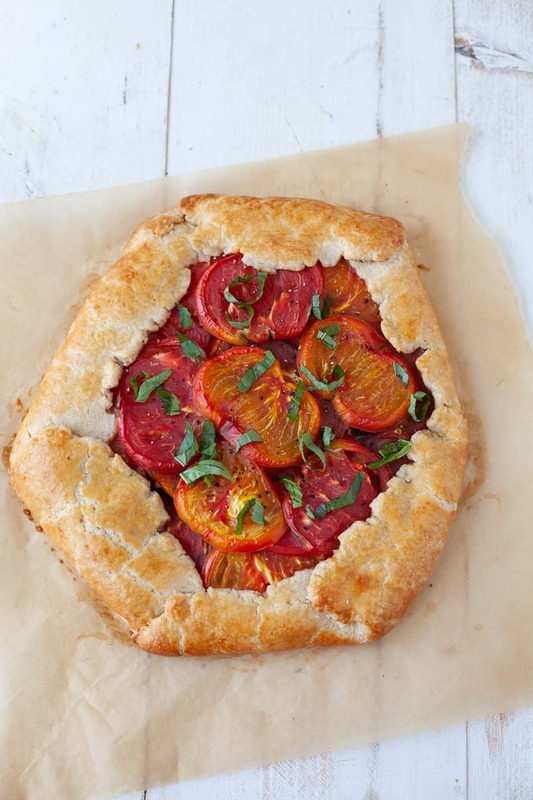 I’ve never actually tried a galette before, but now I have to because this looks too beautiful not to! 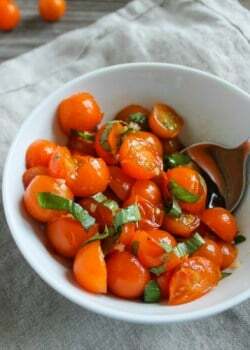 I like how refreshing this is and a perfect way to use up the tomatoes growing in my backyard. Always wanted to try making a galette! I hope you feel better each day. I love this recipe and am happy you were able to put it together for us! You take care of yourself! So beautiful! I’ve never made a galette before but you’ve inspired me. Hope your recovery is going well! I’m glad you’re feeling back to a little bit of blogging and photography!